Dayton National Cemetery dates to 1867 when it was established as a final resting place for veterans who died while living at the Central Branch National Home for Disabled Volunteer Soldiers in Dayton, Ohio. The Central Branch was one of the country’s first institutions developed to care for disabled Union veterans. The innovative, village-like design of the branch inspired the layout and architecture of later National Homes. The cemetery’s 98 acres, located on the north side of the home’s campus, contain the graves of veterans from every major U.S. military conflict from the Revolutionary War to the Persian Gulf War. The Civil War left thousands of volunteer soldiers with injuries and disabilities. Some required long-term care, which was often more than families could provide. In 1865, the U.S. Congress passed legislation creating homes for disabled volunteer soldiers to provide medical care and some of the basic necessities of life; shelter, meals, clothing, and employment. Dayton’s Central Branch home opened in 1867. The branch’s layout incorporated an innovative system of grid patterned streets complemented with landscaped parks and gardens. Civil War chaplain Thomas Budd Van Horne designed the branch with the buildings and streets laid out to mimic a typical village. The scenic parks and gardens, complete with curving pathways, were intended to be a therapeutic respite for the home’s residents. The gardens also attracted thousands of tourists who came to enjoy the landscape of manicured lawns, manmade lakes, and well-groomed flowerbeds. The branch’s buildings feature a variety of architectural styles, including Second Empire, Colonial Revival, Victorian, and California Bungalow. The success of the branch’s design influenced the plan of subsequent National Home campuses. In 1867, a cemetery was established north of the main branch buildings. Originally, the branch set aside 52 acres for the creation of a cemetery; today the cemetery is almost 100 acres. Army Chaplain William Earnshaw, a veteran of the Civil War and superintendent of two national cemeteries, designed the branch’s cemetery. The layout incorporates both naturalist park cemetery design and more regimented systems seen in the plan of early national cemeteries. Today, more than 35,000 burials are contained within the cemetery’s wide rolling hills. Initially, burials in the cemetery were those of soldiers who died while living at the Central Branch. The first interment, a corporal who served in the 104th Pennsylvania Infantry, occurred in September 1867. As the role of the Central Branch evolved from a residential facility to a Veterans Affairs Medical Center, interment requirements broadened to include any veteran. Today, the cemetery’s grave markers reflect every major U.S. military conflict, including World Wars I and II, the Korean War, the Vietnam War, and the Persian Gulf War. Near the cemetery’s contemporary administration building stands the Soldier’s Monument. 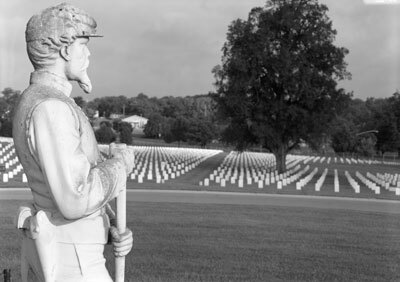 Sited on a low hill surrounded by graves, the monument is a 30-foot-tall marble Corinthian column surmounted by a statue of a Union soldier at parade rest. The column is set on a granite base. At the corners of the base stand figures representing the Infantry, Cavalry, Artillery, and the Navy. Two ornamental artillery cannons flank the monument. The column once stood at the front of Philadelphia’s Bank of Pennsylvania, designed by Benjamin H. Latrobe. Central Branch residents erected the monument, and President Rutherford B. Hayes dedicated it on September 12, 1877. In 1936, the Ohio Society of the Daughters of the War of 1812 erected a monument honoring the heroes of the nation’s final war with Great Britain. The memorial features a large boulder with a bronze plaque dedicated to the 33 veterans of the war buried at the cemetery. Dayton was also the first National Home for Disabled Volunteer Soldiers branch to admit veterans who served in US Colored Troop regiments. Joshua Williams, a private with the 22nd PA USCI, Co. G, was the first US Colored Troop veteran admitted to the Dayton Branch on March 11, 1867, and he is buried in the national cemetery in Section A, Row 10, Grave 56. Joshua Dunbar, a former slave, father of noted poet Paul Laurence Dunbar, and famous person in his own right, is buried in Section E, Row 14, Grave 8. James Hobbs, the great-grandson of Shawnee Chief Tecumseh, is buried in Section B of the cemetery. Hobbs, a veteran of the Mexican War and the Civil War, spent seven years wandering and exploring the West with noted frontiersman Kit Carson. Several geographic features in Arizona are named after Hobbs. Other notable burials in the cemetery include two governors of the Central Branch, World War I veteran and New York Yankees infielder Edmund Burke Magner, and boxer Louis Margolis. Today, the Central Branch Home for Disabled Volunteer Soldiers is the Dayton Veterans Affairs Medical Center, which continues to provide care and comfort for U.S. veterans. In 1973, the management of the cemetery was transferred from the Medical Center to the National Cemetery Administration of the Department of Veterans Affairs. Upon this transfer, the cemetery was officially designated a national cemetery. Dayton National Cemetery is located on the grounds of the Dayton Veterans Affairs Medical Center at 4400 W. Third St. in Dayton, OH. The cemetery is open for visitation daily from dawn to dusk. The administrative office is open Monday to Friday from 8:00am to 4:30pm; it is closed on all Federal holidays except for Memorial Day. For more information, please contact the cemetery office at 937-262-2115, or see the Department of Veterans Affairs website. 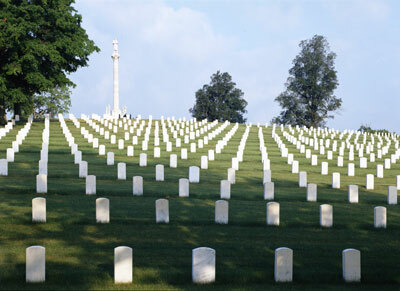 While visiting, please be mindful that our national cemeteries are hallowed ground. Be respectful to all of our nation’s fallen soldiers and their families. Additional cemetery policies may be posted on site. The Central Branch of the National Homes for Disabled Volunteers Soldiers is featured in the National Park Service's National Home for Disabled Volunteer Soldiers Travel Itinerary. The itinerary highlights the 11 homes established after the Civil War. The Central Branch is also the subject of an online lesson plan, A Nation Repays Its Debt: The National Soldiers' Home and Cemetery in Dayton, Ohio. The lesson plan has been produced by the National Park Service’s Teaching with Historic Places program, which offers a series of online classroom-ready lesson plans on historic places. To learn more, visit the Teaching with Historic Places homepage. The campus of the Central Branch, now the Dayton Veterans Affairs Medical Center (VAMC) is open to the public; visitors can walk or drive through the campus. For information on guided tours, contact the Public Affairs Officer or the American Veterans Heritage Center. The American Veterans Heritage Center also manages a museum, which is open from 8:00am to 4:30pm on Wednesdays or by appointment. Dayton VAMC maintains a virtual museum about the facility’s history. Additional information can be found on the Dayton VAMC’s website. Please respect the privacy of veterans utilizing the facility. Dayton National Cemetery was photographed to the standards established by the National Park Service’s Historic American Landscapes Survey. Numerous buildings on the grounds of the former National Home have been photographed to the standards established by the National Park Service’s Historic American Buildings Survey.